As the White House prepares agencies for absorbing large-scale spending cuts, President Trump on Friday fleshed out his budget team, naming a deputy director of the Office of Management and Budget and a regulatory administrator. Trump tapped the vice president for the conservative advocacy group Heritage Action for America, Russell Vought, to serve as deputy to budget director Mick Mulvaney. A 12-year Capitol Hill Republican staffer and attorney, Vought has been policy director for the House Republican Conference (working under then-Rep. and now-Vice President Mike Pence) and previously was executive director of the Republican Study Committee. Slated to run Trump’s Office of Information and Regulatory Affairs is Neomi Rao, a professor at the Antonin Scalia Law School at George Mason University in Arlington, Va. She founded a project there called the Center for the Study of the Administrative State. Previously, Rao was associate counsel to President George W. Bush; counsel for nominations and constitutional law to the Senate Judiciary Committee and law clerk to Supreme Court Associate Justice Clarence Thomas. Rao is one of two Indian-Americans Trump named this month, the other being House Judiciary Committee Senior Counsel Vishal Amin to be White House Intellectual Property Enforcement Coordinator. 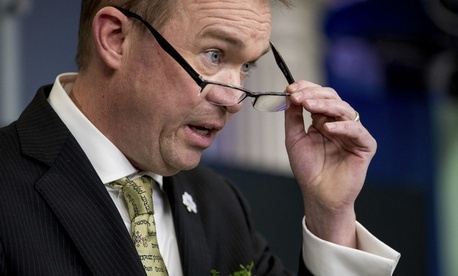 Budget chief Mulvaney, meanwhile, was reported by Axios to be preparing new guidance for agencies this week instructing them to “create plans to make themselves significantly smaller and less costly” as part of Trump’s ongoing efficiency push.